Hi, I love your patch pack, and I've been using it for years, but I've noticed on my line where fast trains and slower trains use the same space, there is a lot of stopping and starting which is somewhat annoying and causes a lot of annoyance. That's when I remembered this exists, a yellow signal patch which limits the speed of trains if there's one in the block ahead. Would it be possible that you could add this on to your pack, I think it'd be a great addition to the game . You can find what I'm on about here. This really do come up once in a while. Maybe JGR should make a list of considered and rejected patches. It's hard to find the original response now, but the gist is that that patch still has some design problem regarding reservation into junction. And what annoy me personally the most is that the R-Y-YY-G is European, while Japan use R-YY-Y-G. My railway knowledge and play style is predominantly Japan so this really annoy me. But this really is unrelated. I'd say that this stops being a problem if you want to put the time in to fully timetable your trains. Also, I played with this patch and found it didn't entirely help traffic jams. viewtopic.php?f=33&t=52085&start=20 , this sounds good , seems to be the logical answer to having a slower train in front . Just run a four track (two up, two down) with crossovers regularly spaced. I do this especially on passenger lines with slow mail and fast passenger trains. Fast trains then change track and overtake the slow train. You do need the space for four tracks of course and there is a need to drop to two track (one up, one down) sometimes because of space restrictions, just signal appropriately. I do this, but I also use the signalling restrictions to keep slower trains on the outside and faster trains on the inside. Quite happily, this also takes into account breakdowns, so an express that has broken down and is now crawling along will choose the slow line rather than the fast. Been a while since I just played the game, as I have been mostly developing stuff for the game. But I want to try to get back into playing a bit more and this patchpack seems to have all the features I would like to have in a game and will hopefully in the future get even more desireable things like multiple roadtypes and realistic shunting. 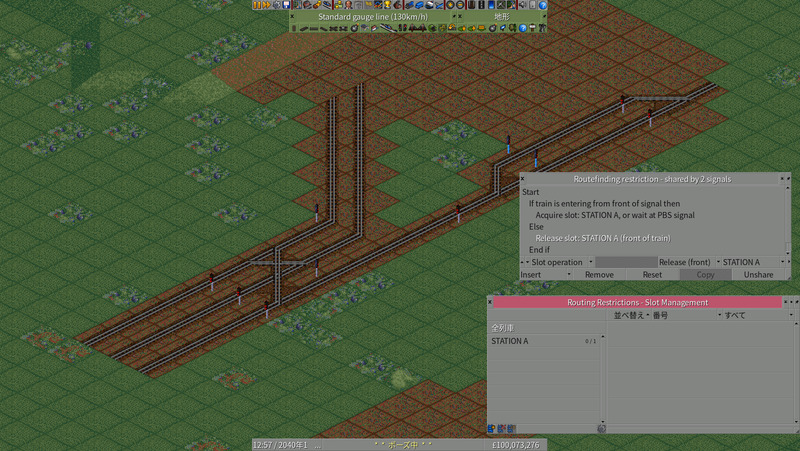 I do have two questions though..
- Would it be possible to add a parameter in the gamesettings to disable the (un)loading penalty for trains that are longer than a station? - Are there plans to add a part of Cirdans NewMapFeatures fork, that allows two different railtypes on one tile? (when the rails are horizontal/vertical)? 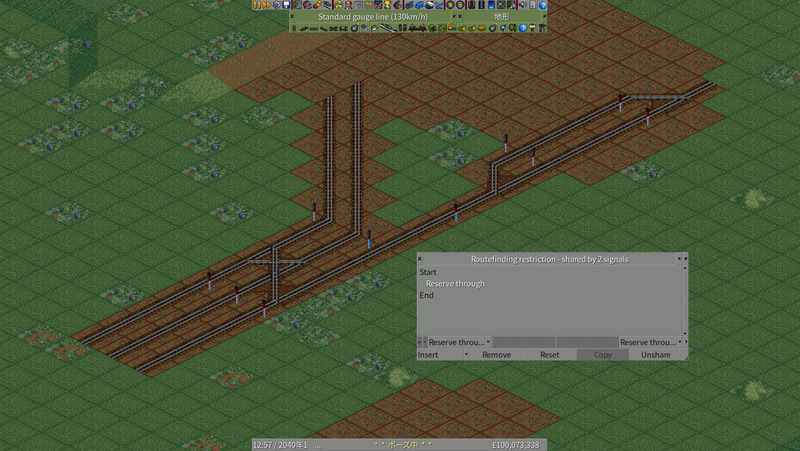 You know that you can change that in openttd.cfg, right? yapf.rail_shorter_platform_penalty etc. It's in the Czech language, I hope it will not deter you. Maybe its an extra penalty over the already existing overhang-penalty of the game. What is needed is that a part of economy.cpp needs to be removed/altered (I removed it for the old game I am currently using and then recompiled that game and that does the trick, but it would be nicer if it is included as a patch). This would for example be nice for short stations at the end of a tunnel, that way the train stops partially in the tunnel, faking an underground station. Or for a short station in between or at the end of a bridge, to fake a station on a bridge. Oh, sorry, I thought you mean pathfinding panelty, not loading speed panelty. Reading the original.discussion, if you aim for realistic, JGR has load-through mode (you need to enable in setting, and it will be part of middle/far end/near end cycle. Basically the train will align the first set of wagon to station, load only those wagon, move forward to next set of wagon, repeat. It works and looks real. Not sure if this is what you really want though. That is indeed not my aim. It is nice and realistic for regular short stations, but my aim is for short stations in combination with a tunnel/bridge. It is for freight only. Passenger trains would need to be handled differently to get what you're after, at this point you simply have to have a full-length platform. Hi. I have been trying to play in a server that uses your patch version 0.27.0. But everytime the map gets loaded the game gets super slow, my CPU usage goes to 100% and the only clue i get about this is using debug mode. i get this error spammed in console. I have digged in the code trying to find the newgrf responsible or if it is something with the patch or openttd itself but i can't seem to find it. I'll attach the server savefile so you can test if it happens to you too and if you have any clue on what is causing this. UPDATE: i found the newgrf responsible for the errors. now i am asking the creator what he knows. It was 2cc Trains In NML version 3.0-alpha2. Hi JGR, I have a little bit question here. Those red and green were signals and its direction. All of them were path signals. My question is, how I can hold train 2 in station B until train 1 depart from station A, then pass train 2 in station B using routefinding restriction? Is there a way to do it besides making new crossovers in station A or double tracking the track? Not sure if I understand your diagram correctly. But first, you don't really need two Red-colored signal on the single-track line. Then train departing left station will need to reserve the path all the way into platform in order for it to depart. Of course, this is still not perfect, but it's easy to do. If you don't want the train to reserve the platform early (maybe you need it for train from the other line in the meantime), then you need to use SLOT. You need to enable them first in settting (iirc it's "Advanced routefinding restriction" setting). Thanks for answering. Yeah I'm trying to make my rail lines as realistic as possible. What does reserve through actually do? I never use that because I don't understand its usage. And yeah, I'm still confused about the slots. Could you please elaborate it to me by using my diagram above?